Note: These are GUARANTEED tickets rather than first-come, first-served screening passes. If you enter to win this special Hookup, you MUST be able to attend on the time, date and suburban location of this advance screening. Please do not enter if you cannot. Our winners must check in with an “Anchorman 2” representative near the box office. The names of our winners will be on an RSVP list. Our winners will be handed movie tickets. 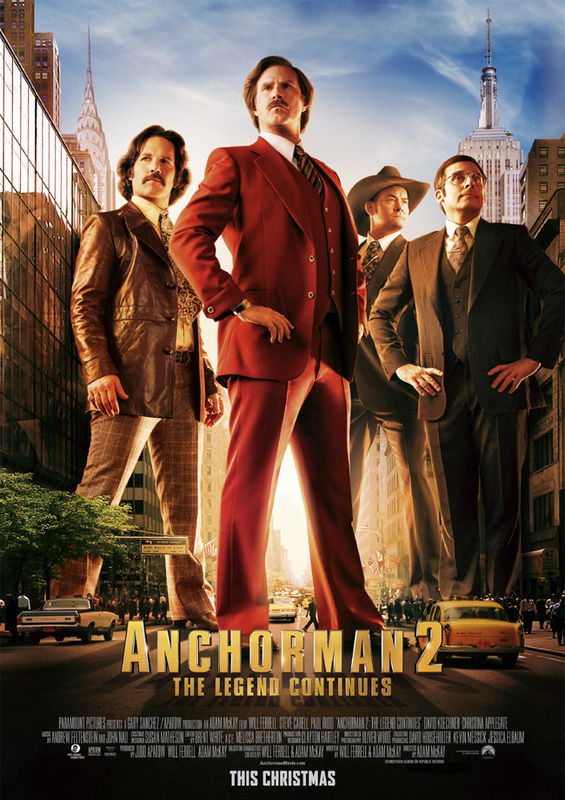 “Anchorman 2: The Legend Continues,” which is rated “PG-13” and opens on Dec. 18, 2013, also features an all-star cast including Paul Rudd, Steve Carell, Christina Applegate, Vince Vaughn, Kristen Wiig, Jim Carrey, Harrison Ford, Kirsten Dunst, Liam Neeson, Sacha Baron Cohen, Tina Fey, James Marsden, Greg Kinnear, Amy Poehler, John C. Reilly, Luke Wilson, Fred Willard and Kanye West from writer and director Adam McKay and writer Will Ferrell. To win your free “Anchorman 2” tickets courtesy of HollywoodChicago.com, just get interactive with our unique Hookup technology below. That’s it! This screening is on Monday, Dec. 16, 2013 at 7:30 p.m. in the Chicago suburb of South Barrington. The more social actions you complete, the more points you score and the higher yours odds of winning! Completing these social actions only increases your odds of winning; this doesn’t intensify your competition! With the 1970s behind him, San Diego’s top-rated newsman, Ron Burgundy, returns to take New York’s first 24-hour news channel by storm. The movie poster for “Anchorman 2: The Legend Continues” starring Will Ferrell, Paul Rudd and Steve Carell! This HollywoodChicago.com Hookup is simple! Just get interactive in our unique Hookup technology above. We will award 50 admit-two guaranteed movie tickets based on social entry numbers and/or randomly via e-mail for our “Anchorman 2: The Legend Continues” Hookup. Good luck! Winners must arrive early. We recommend arriving at least 1 hour before the scheduled start time. HollywoodChicago.com LLC is a promotional partner with the studio and its partners and doesn’t assume any liability for this giveaway. HollywoodChicago.com is not responsible for errors or omissions entered in user submissions. Comments are closed in this Hookup.